Focus Groups are research tools that afford attorneys the opportunity to meet with mock jurors in a conference room atmosphere. Mock jurors, who reflect the community in question, are carefully screened and recruited. Attorneys present both sides of their case in a story-like, opening statement style. Next, the mock jurors are read instructions on the law, given a verdict form and left to deliberate. Deliberations are both monitored by the attorneys via closed-circuit television and videotaped for a more detailed analysis later. After arriving at a verdict, CRJSI then moderates a question and answer session which is designed to scrutinize the thinking processes of the mock jurors and evaluate the persuasiveness of selected documents, evidence, and arguments. Attorneys can also participate in these post-deliberation interviews. Finally, mock jurors complete post-deliberation questionnaires. 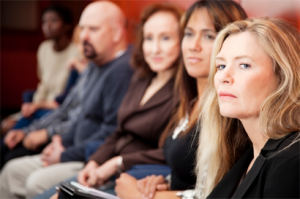 A series of focus groups is normally run to facilitate the fine tuning of a case. Mock jurors are then given substantive instructions on the law and are sent to deliberate. Deliberations are both monitored by the attorneys via closed-circuit television and videotaped for a more detailed analysis later. After arriving at a verdict, CRJSI then moderates a question and answer session which is designed to scrutinize the thinking processes of the mock jurors and evaluate the persuasiveness of selected documents, evidence, and arguments. Attorneys can also participate in these post-deliberation interviews. Finally, mock jurors complete post-deliberation questionnaires. Mock trials can be conducted individually, but are best utilized at the end of a series of focus groups. The Individual Opinion Survey provides a snapshot of demographic predispositions. Prospective jurors are screened and then chosen respondents are directed to a secure website where they fill out a Background Questionnaire and watch a video of the case facts. They then fill out a Post-Viewing Questionnaire. It does not replace the information derived from a full-blown focus group or mock trial, however, this type of research is perfect for a quick, cost-effective gauge of a prospective juror’s perceptions on a topic or case before any other personalities can attempt to sway their opinion. The Focus Group with Deliberation adds the flavor of group dynamics into the equation. Prospective jurors are screened and directed to a secure website to view a video of the case facts. After all respondents have watched the video and filled out the Pre-Deliberation Questionnaire, the group is then engaged in an online Video Chatroom with a CRJSI moderator present. After they interact and share thoughts and opinions, they fill out a Post-Deliberation Questionnaire. Through community attitude research, CRJSI is able to survey individual opinions. This approach gains insight into the community’s awareness of the case and the issues surrounding it, and can identify any pre-trial publicity biases that may have formed. This type of research also assists in developing juror profiles and can begin to gauge liability and damage ranges. Additionally, CRJSI can apply this research to the design of pre-trial questionnaires and can use the results to assist with change of venue motions. CRJSI also can conduct post-trial interviews with jurors. This feedback can be extremely useful, especially when similar litigation my be pending. 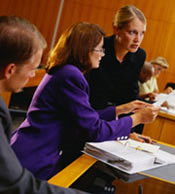 Witnesses need preparation for depositions as well as for trial. CRJSI can help improve witness demeanor, clarity and overall performance by incorporating the witness into a focus group/mock trial setting, or by using individual video-taped sessions. CRJSI helps both the attorney and the witness use better communication skills to get the message across, as well as prepare the witness for cross-examination and jury scrutiny. A picture can either be worth a thousand words or can cause mass confusion. The right demonstrative is often the turning point for many jurors if they can understand it. CRJSI assists in designing the most effective demonstratives, as well as improving upon existing graphics, charts, letters, animated videos, day-in-the-life videos, settlement brochures, etc. 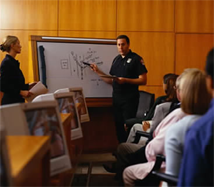 In addition, CRJSI helps attorneys select the most appropriate medium for presenting demonstratives. State of the art computer systems can be utilized to get the message across in the most efficient manner, especially when large amounts of documents need to be called upon at a moment’s notice. However, simple charts, graphs and blow-ups could still be the best approach. Our jury research can assist in choosing the best method. CRJSI also offers individual case review and consultation. One of our expert consultants meets with you to review key documents and evidence, and then helps to design an effective, succinct opening statement. Additional recommendations for trial strategy and jury selection are also provided. Our jury selection services include the development of voir dire questions that will help to identify juror attitudes and biases. Assistance with the actual jury selection process is also available. We pride ourselves on our ability to deliver quick and direct recommendations regarding which prospective jurors to accept and which to strike. We also offer trial monitoring services. We can be present in the courtroom during the entire length of the trial, observing the daily proceedings and providing feedback and recommendations as the trial progresses.